Your private haven close to hubs. Outdoor enthusiasts, delight in new 3 bedroom, 2 bath Contemporary style home. 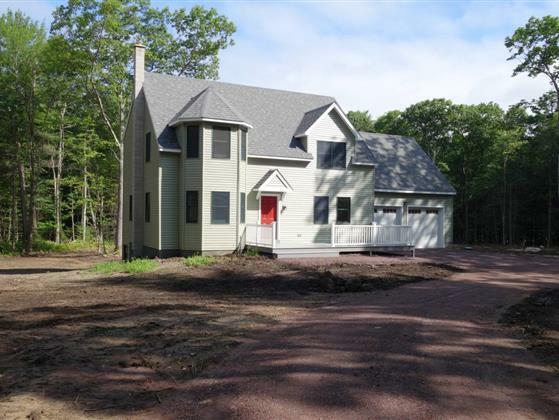 Nestled into 4 cleared & wooded acres on a circular drive, home is surrounded by protected land. Enjoy kayaking at Ruggles Pond & hiking in Wendell St. Forest & on Robert Frost & Mt. Grace Land Trust trails. Property is centrally located 20 mins. north to Greenfield & 30 mins. south to Amherst, academic hub. Stay connected with Comcast internet* & great cell service. 2600 SF includes LR w/ woodstove, eat-in kitchen with all the bells & whistles,1st floor bedroom & full bath. Custom details include hand-hewn beams, cherry & walnut trim on windows, Country Maple flooring on both levels, & not one but TWO, large TREX decks. Besides MBR, 2nd floor sports 2 bedrooms + full bath, stunning, multi-purpose bedroom/bonus room + office space & laundry. Built according to the Stretch code, the house touts a 53 HERS reading.